The Tank | No, YOU Tell It! Nelson Lugo’s one-man shows feature slight-of-hand and are full of heart as he interweaves magic with storytelling. We were honored to have him develop a deeply personal story with us for our “Wild Card” show. Click here to give a listen to his true-life tale “Crazy Sad” about magic, mental institutions, and the miracle of a well-made cookie in Episode 16. Coming up on April 7th! 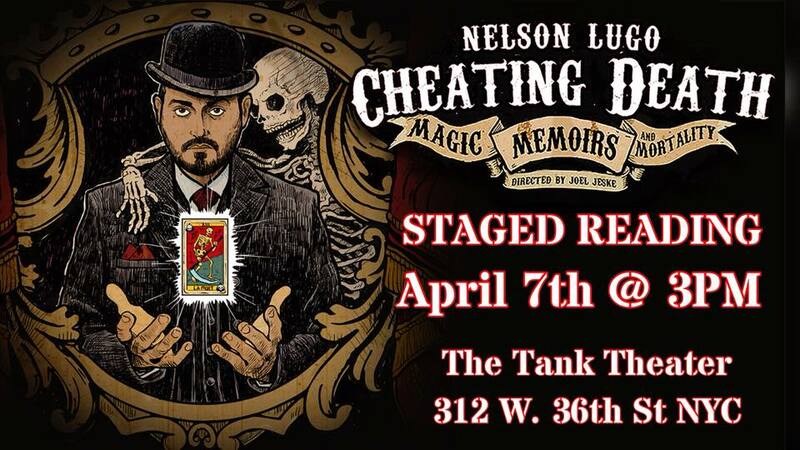 Grab a ticket see Nelson’s newest show – Cheating Death: Magic, Memoirs & Mortality – a personal examination of one magician’s life – or more specifically – his many brushes with death. The raw vulnerability in the stories is heightened by the wonder, intimacy, and sometimes danger of the classically performed parlour magic. The result is a joyful celebration of life and all of its varied deaths.